Those words from that great humanitarian and musician Pablo Casals describe conditions in the notorious Argelès-sur-Mer internment camp in 1939. After Barcelona fell to Franco's fascist forces in the last months of the Spanish Civil War almost half a million Spanish Republican civilians and soldiers struggled across the eastern Pyrenees to what they thought would be freedom in France. But the French government, which had signed a European non-intervention agreement, herded the refugees into settlements which Casals describes as concentration camps and which were known elsewhere as les Camps du Mépris - camps of scorn. 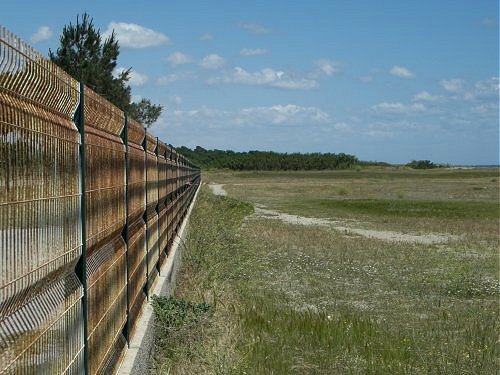 La retirada (retreat) was one of the largest human exoduses of modern times and it is estimated that 15,000 Republican refugees died in the French refugee camps. Yet it is one of several political skeletons the French managed to lock away in cupboards for many years - among the others are their subjugation of Algeria, Tunisia and Morocco, the links between some elements of the Catholic church and the extreme right-wing, and the Vichy regime's active persecution of Jews and other so-called “undesirables”. 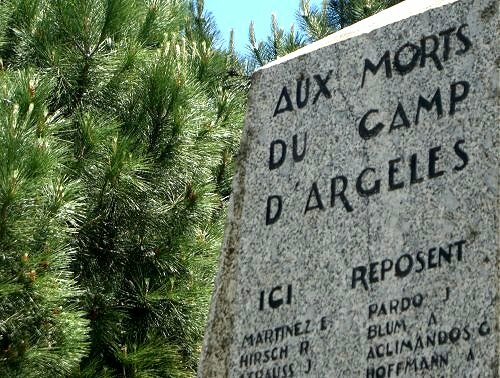 As a self-confessed Casals groupie I was familiar with the story of the French concentration camps and of the Catalan musician's selfless work on behalf of the refugees. 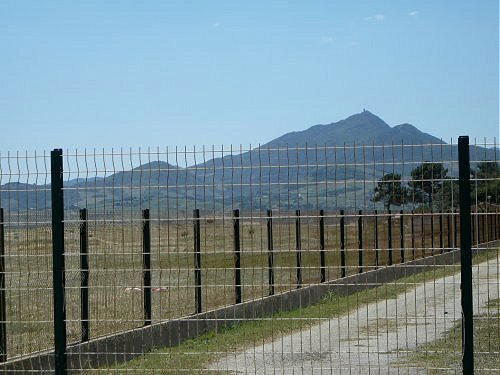 But I wanted to see for myself, so last summer I set out from England with my wife to find the forgotten concentration camp at Argelès. Our exit from the E15 autoroute was at Le Boulou, the site in 1939 of a transit camp from which refugees were sent to other camps in the region. We followed the route of the exiles towards the sea and finally arrived at the site of the Argelès-sur-Mer concentration camp after a journey of 1150 miles. 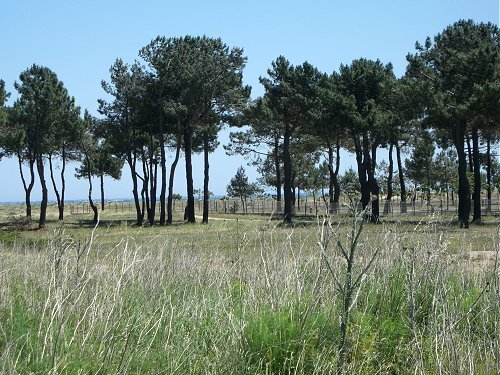 As Pau Casals describes, the camp was situated in an open area among sand dunes on the seashore. The area is now a tourist beach and the photo above shows the landward border of the old camp, this is now a car park with only a small plaque to mark the area's grim history. 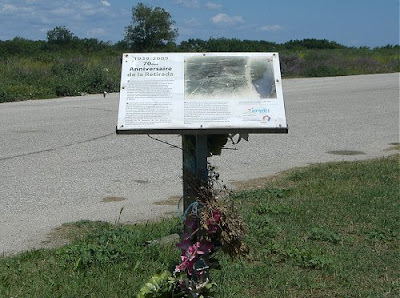 As can be seen in my photos sand dunes have long since reclaimed the area and there is no evidence of the camp other than a few poignant memorials. Several of the photos use the perimeter fence of a tourist camp sites to evoke the atmosphere of 1939. 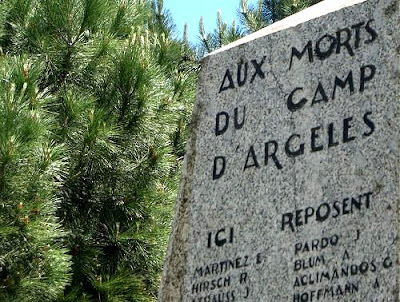 Casals lived in exile in Prades at the foot of Mount Canigou, and the mountain which means so much to Catalans was visible through the wire of the Argelès camp, as can be seen above. The Catalans are fiercely patriotic and Lluis Companys, president of Catalonia, was one of those who fled across the Pyrenees only to be interned. After the German invasion of France in 1940 the Vichy government handed Companys over to the Spanish fascists and he was executed in Barcelona. Catalan folklore tells how as he faced the firing squad he removed his shoes and socks to die with his feet on the soil of Catalonia. * Photo essay on the nearby Rivesaltes internment camp here. * Header quote is from Joys and Sorrows, reflections by Pablo Casals edited by Albert E. Khan (Macdonald ISBN 356030482) now out of print. Also recommended is Rosemary Bailey's Love and War in the Pyrenees (Phoenix ISBN 9780753825914), Rosemary Bailey is, incidentally, the wife of the biographer of Allen Ginsberg and others, Barry Miles. * One of the many points made in Rosemary Bailey's excellent book is the vital role that the Quakers played in helping the Republican refugees, and in particular the work of two English Quakers Edith Pye and Hilda Clark who were partners in action and in their private life. The pacifist role of the Quakers deserves another path. * Regular readers will know the coda to this post. Soon after these photos were taken, like so many Republican refugees I was taken by ambulance to a hospital in Perpignan. At times conditions in the Clinique Médipôle Saint-Roch à Cabestany - Perpignan resembled a 1939 concentration camp. But I have now almost completely recovered and, undaunted, we will be back in Catalonia in May. * Related resources include In search of Pablo Casals, Are authentic performances a silly convention? The magic mountain and A musician is also a man. I can assure you, Bob, that those French skeletons have been out of their cupboards for quite some time. There has been a spate of excellent academic works -- very accessible to the general reader and variously available in public libraries -- on Vichy France, including the role of the Catholic Church. It altogether paints a very grim picture indeed. At this very time, I wish the same would be done re the roles of Slovakia and Hungary in the Holocaust. The literature her is substantial, but there aspects that require emphasis and broadcasting. The President of Slovakia from 1939 to 1942 and thereafter 'vodca', or fuhrer, was Father Jozef Tiso. So rabid was he in his desire to ship Jews out of the Slovak state that he managed to irritate Eichmann by rounding them up faster than transport could be arranged. He was hanged in 1947. I suppose one has to say that Hungary has a better record in that Jews and Roma were not turned upon until 1944. The Horthy regime's reluctance I attribute in good part to its desire to keep one foot in each camp, i.e., its intent upon maintaining some measure of cordiality with the Allies. But in 1944 the national socialist Arrow Cross Party seized power and Jews and Roma were either slaughtered on the spot or transported. Now, this and the Slovakian story are less well-known, I suspect, than that of Vichy France and the teeth-grinding hypocrisy that ensued. I mention all this at some little length because in Hungary, the fascists, anti-semites, anti-Roma parties and movements are very close to taking complete power. That is why some time ago I joined 'artistsagainstracism.eu', a movement founded by Adam Fischer, the conductor, to combat fascism and racism in Hungary, in Europe, wherever, indeed, it may rear its horned head. How Fischer came to do this is explained in the website above, so I need not expatiate. It's not easy, but I can end on a happier but still relevant note. While Tiso was cramming Jews into cattle cars in Slovakia, in Bulgaria, the Bulgarian Orthodox Church, a host of politicians and a slew of citizens joined in protecting the country's Jews, and successfully. The most senior Metropolitan of the Church said that he would lie on the railway lines in front the train before he would allow the transport of Jews. This very much relates to Savall's concern with evil and beauty, although I prefer to think of the dichotomy as evil and good. The greatest display of altruistic goodness I have ever come across came from a woman who was asked why she helped Jews in Nazi Germany itself. She was at first genuinely perplexed that the question was asked. "How could I not?!" was her response. That is pure altruism, Kant's categorical imperative writ large. That this is so much rarer than evil-doing or standing by ("All that is necessary for the triumph of evil is that good men do nothing") is what makes it, to me, greatly more interesting. I would urge people to visit artistsagainstracism.eu and consider joining. Fischer and his colleagues and beleaguered in this. Thanks for that valuable addition Philip. My wording has been slightly amended in light of your comment - what I meant with my reference to Vichy, the Catholic Church and Jews was that there is still a general perception outside France that during the Occupation almost the entire population of the country spent its time either huddled around illegal radios listening to de Gaulle broadcasting from London or sabotaging railway lines.In fact, as you point out, the reality was very different. This is a subject which I will return to in the near future. Thank you for this piece. I am visiting this area next week and would like to visit these sites. Do you have any addresses for them or how to find them? I am struggling to find them on google maps. mushypea, the Argeles camp site is difficult to find as there is nothing left of it other than the memorial plaque seen in my photos. Driving north out of Argeles towards St Cyprien the D81 crosses the River Tet. The camp occupied the area on the south of the river - i.e. before you cross the bridge - between the road and the sea. If you park before the road bridge across the Tet you should be able to identify the camp location from my photos. Ironically Camping Soleil now occupies some of the area of the internment camp. Since I wrote about Rivesaltes camp in 2013 a memorial museum has been opened and should be signposted. Leave Perpignan on the D900 heading north towards Montpelier and drive past Perpignan airport. Take D83 then D12 and finally the D5 north (right turn - not D5 south left turn) - all those junctions are very close together. The site of the camp and the memorials is on the right of the D5 and is marked on the Michelin map as 'Terrain militaire'. 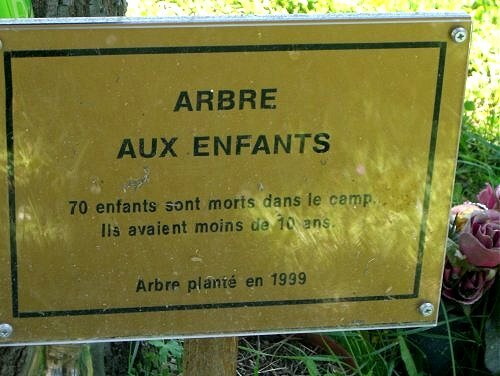 The Rivesaltes memorial has an excellent French language website which includes directions.